…are profiled in this CNN article. This exciting new generation of camera wielders are rapidly changing the image of the continent and many share their work with thousands of followers on instagram (check out “truthslinger”‘s profile and the incredible images of life in Kenya he shares with 35k followers). 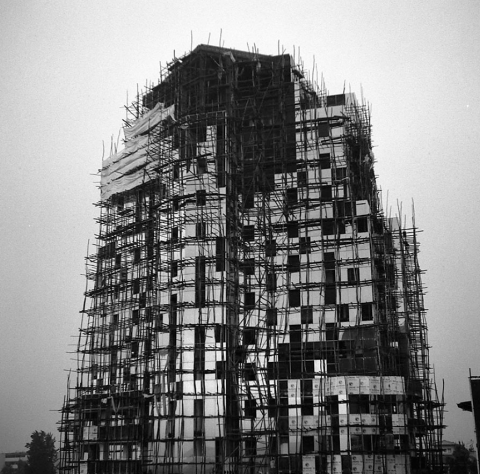 I especially like the “Future Memories” series by Michael Tsegaye that captures bleak frames of recent large-scale Addis Ababa construction projects juxtaposed with more rural imagery (cattle, hand-washing clothes, and a great one of silhouetted wooden scaffolding). I don’t usually love black and white photography, but in this case, the medium does a perfect job of capturing the rapid inevitableness of the fading and cracking that the buildings will endure as they age. Do these images give a glimpse into the memories of this new wave of large-scale construction projects? Will they be remembered differently than the grand independence era towers and monuments that now look painfully optimistic in photographs from the time of their celebratory completions.